I call her Mellow Yellow - quite rightly! 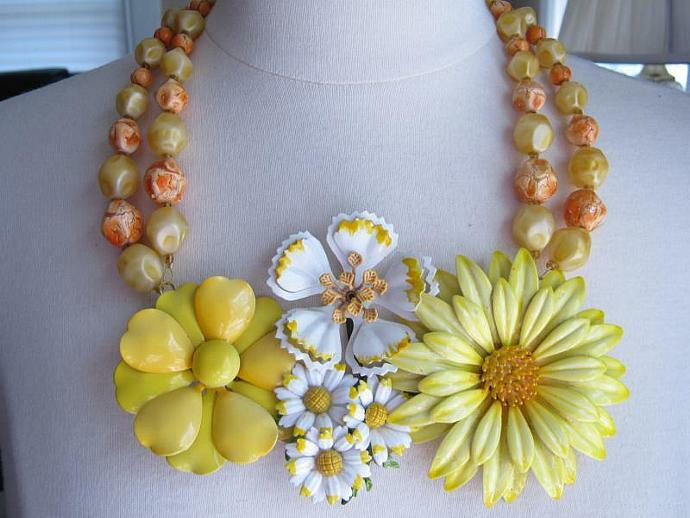 My latest flower power statement necklace is a vibrant burst of yellows, ready for sunshine and fresh air! She is composed of four vintage enamel flower brooches and a multi-strand vintage beaded necklace that I’ve deconstructed into this beautiful floral assemblage. The largest flower measures 3.25 inches across and the entire bib is almost 6.5 inches across. The interior circumference of the necklace measures 17 inches plus a 2.5 inch extension chain. I’ve signed this unique and one of a kind original design with my 14K gold plated signature charm. If these pieces could talk, what a fascinating story they would tell - now it’s time to add your own story to this beautiful piece of history. A couple of notes about shipping: US Shipping is via Priority Mail and the price includes signature confirmation and insurance. For shipping outside the US the quoted shipping charges are for a flat rate International Priority Mail padded envelope. Please take a look at the additional information found in my shop Policies prior to completing your purchase - thanks!